It was for a friend of mine who recently is going to get engaged. She was a hostel friend of mine and had lead a very difficult life. From a mom who left them halfway, to dad who was not bothered, both she and her brother have made their own way in life. No roof to stay during holidays, they stayed at some relatives house. Oh god! just thinking about such insecurity gives me chills.. Seeing her i would thank god for giving me something as basic as 2 loving parents!!! Even with so many hurdles, she always had a smile on her face. She believed in enjoying simple joys of life. I am soooooooooo happy that finally she met someone who will give her ample of love and joy she truly deserves. I wished to gift her something priceless that she would value throughout her life. And she being an artist herself, i really had to think hard on a theme. This is the inside of the card. 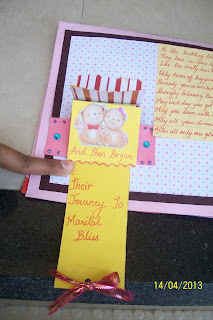 The pedestal pop up has been inspired from Dr. Sonia's blog. The link to her tutorial is here. I recently purchased Martha Stewart lattice heart punch from my dear blogger friend Priya craft store. Please do visit her store. She gives stuff at very reasonable rates. MS punches while feel as though they dig a hole in ur pocket. But once you use them, the feeling is absolutely priceless!!! I have fallen in love with it!! 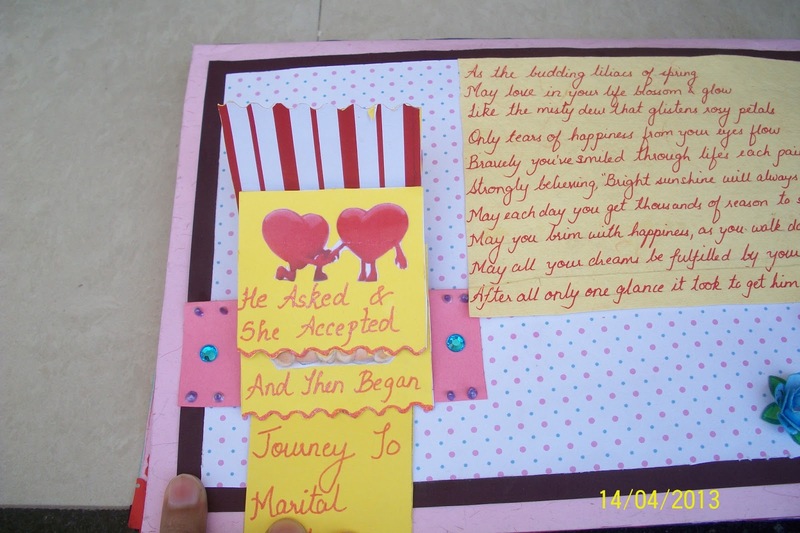 I will have to brush up my photography skills i guess :) But hope u guys liked the card. Am a little nervous about how would Tulsi like it. I really hope that she loves it. Please do leave back your comments too!!! 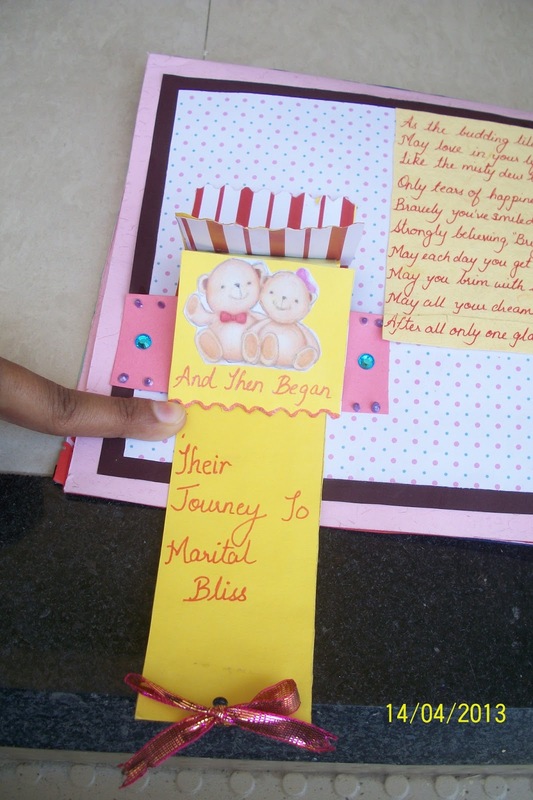 Bijal what a touching story you have shared and so happy you have linked to me. Enjoying seeing your pop ups..fabulous!! Thank u doc for ur encouragement! Brilliant card! Thanks for joining us at Stamping Sensations. I'm back again...Thanks also for joining us at Joanna Sheen challenge with your great card. This is so cute! Love the waterfall card on the side! Thank you for joining us this week at Fab'n'Funky! Thank u so much Dewi!! 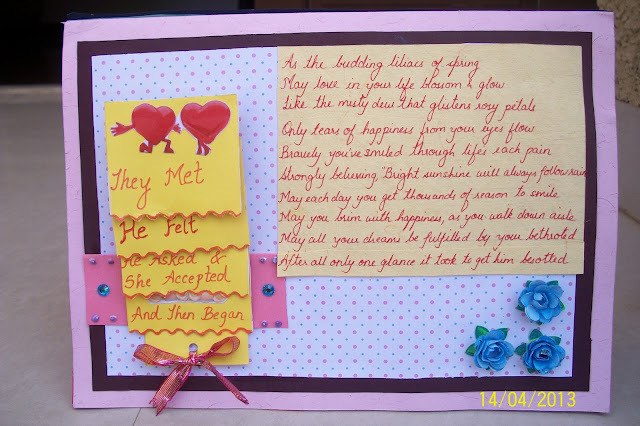 What a lovely card and made with so much heart Bijal!..I am sure your friend must have appreciated your gesture very much...Really love the pop-up you have done on the inside! 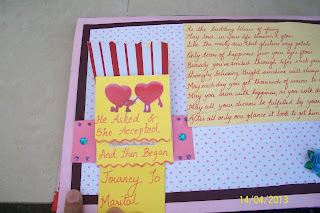 She loved it and was extremely touched reading my blogpost on her. Thanks for your lovely comments!! 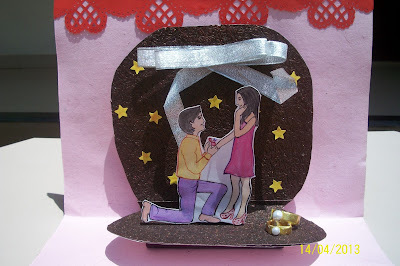 Cute card!!! Thanks for participating in our PLATYPUS CREEK DIGITALS challenge!! Hope to see you again next week! 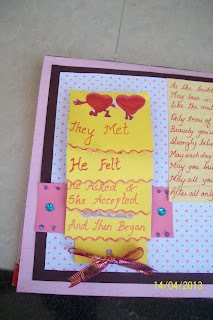 Sally beautifully personalised card Bijal. Thank you so much the sharing your inspiration with us at Penny Black and More challenge. Thank u so much Brenda! This is so cute I'm glad I cam back to see it it makes me happy!! Hey Diana...thank u soo much for dropping by again!!! Hey Bijal! 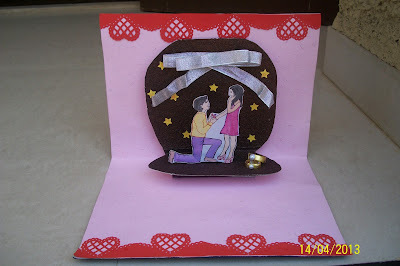 What an awesome card you have made. Love the pop up...Love all the interactive elements... very thoughtful! Thanks so much for sharing your beautiful creation with us at 'For the love of crafting'. All the very best. Thank u soo much for such lovely comments...Tulsi loved it alot...was surprised and happy! Hello and welcome to Opus Gluei, I'm delighted you found us and took the time to create with us. You are the kind of friend who is honest, true, and wonderful. What a dear friend you are and this is such a gift from the heart. I am sure she will adore it and cherish it with special things she keeps near and dear. 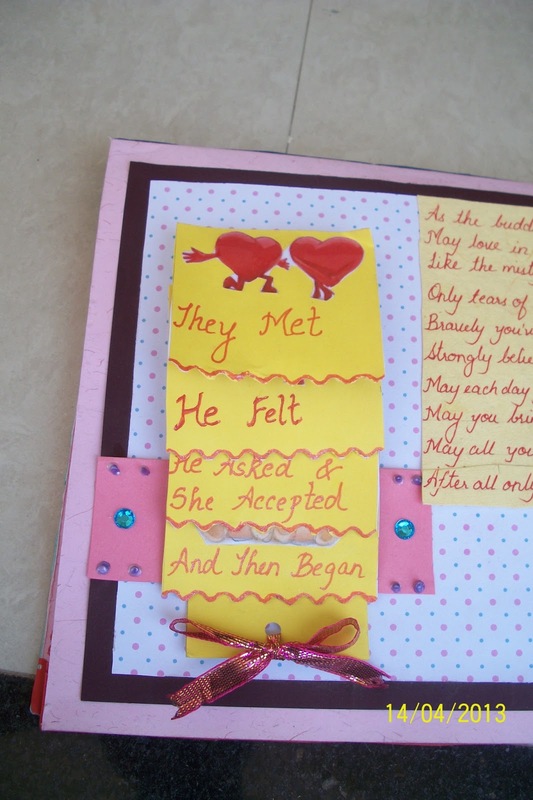 The elements of the original poem (I love that it was only one look and he was besotted, that's great) and the hearts and the pop up make it not only special but reinforce that idea of made with loving hands. 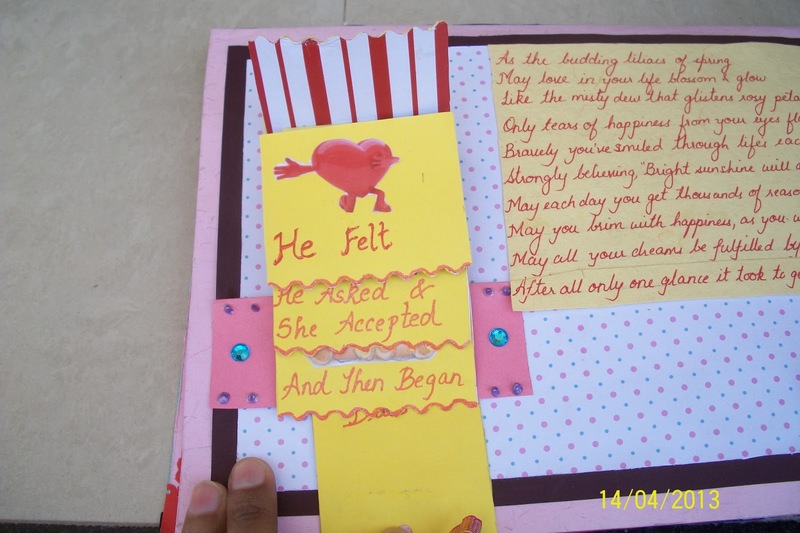 Thank you for the story behind your creation and your lovely card! Thank u sooo much Rosemary...What lovely things to say...She did adore it and was surprised to see her name on the blog!!! Dear Tulsi, U deserved it!!! I wanted to really gift you something that would be precious to you!!!! ohhh wow your card really show the love you have use to make it. It's gorgeous and so full of details. Love how you have done the engagement rings. Fabulous idea! Thanks for sharing with us at Lacy Sunshine! Hope you join us for the next challenge.